First up is the most important meal of the day. 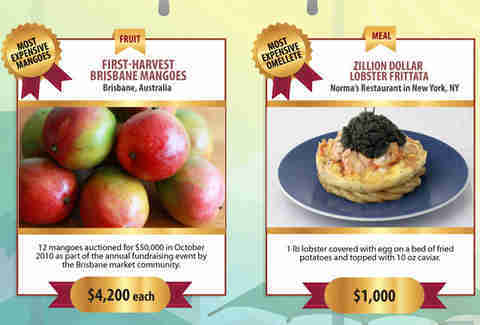 After you've snacked on some $4,200 mangoes flown in from Australia, head over to Norma's in NYC for her infamous Zillion Dollar Lobster Frittata, which is actually just $1,000. A pittance! You're going to be eating a massive lunch, so loosen that belt buckle a notch and get ready. 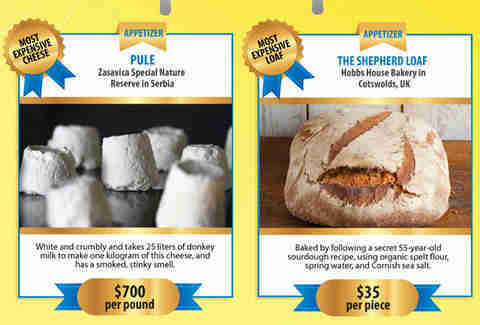 For your appetizers, there's Serbian donkey cheese (pule) and some fancy sourdough bread. This wouldn't be a rich person's lunch if it didn't involve caviar, so they got the priciest kind. 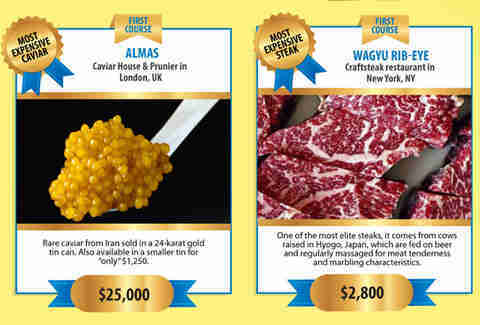 Plus Wagyu rib-eyes, since you already took care of the mandatory lobster at breakfast. 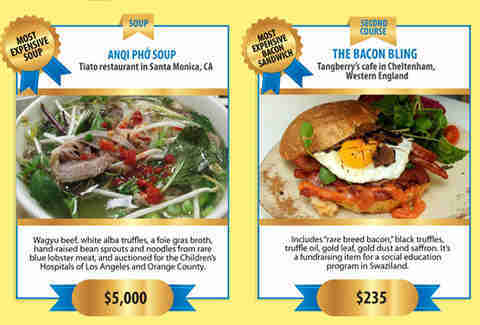 We heard you like Wagyu, so we put even more in your $5,000 pho. 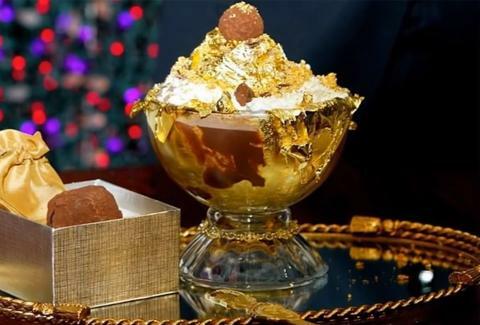 But that soup is really just a palate cleanser before the Bacon Bling, which is an expensive burger and not, as we assumed, a novelty bacon ring. Obviously the costliest cake around is wedding cake, but Finances Online didn't steal from just some nobody's reception hall. 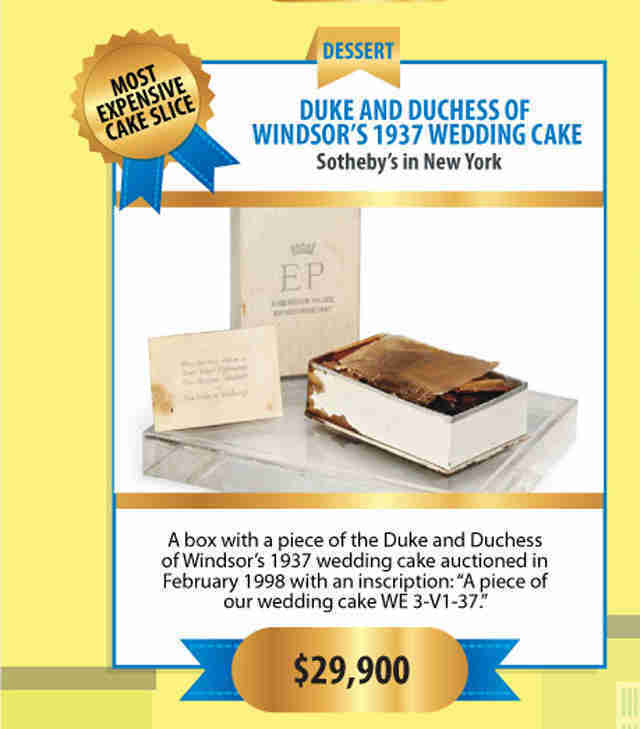 They got a royal wedding cake all the way back from 1937. Hopefully acquiring this slice works out better for you than it did for Mr. Peterman. 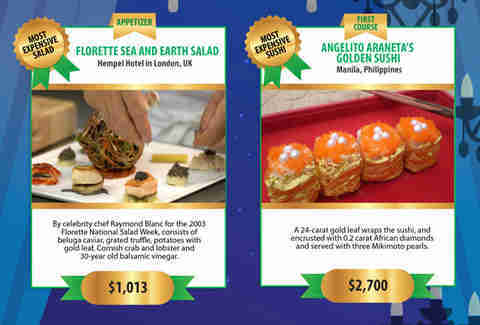 Provided your stomach hasn't clenched forever after that 77-year-old cake, you've got a $1k salad and golden sushi to eat for dinner. 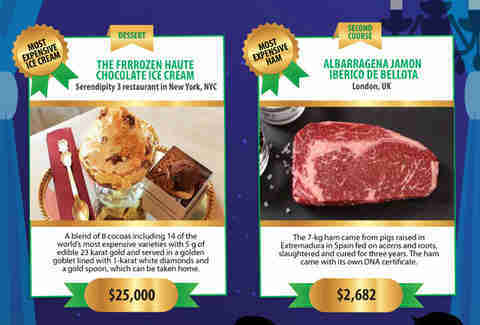 And finally, just to shake things up, have your $25,000 sundae and then your super special ham. A wheelbarrow will be waiting outside to take you home. Because you just blew your cab money. For eternity. Kristin Hunt is a food/drink staff writer for Thrillist, and will stick with the cheap slices of fresh cake. Follow her at @kristin_hunt.